Bethel Chamber Hosts Ribbon Cutting Block Party on Saturday! 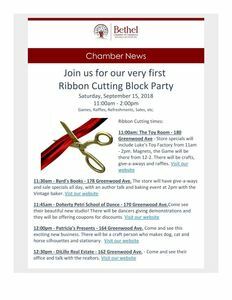 Bethel Chamber Hosts Their FIRST Ribbon Cutting Block Party on Saturday, September 15 from 11 am to 4 pm. Join fellow community members for games, raffles, refreshments and sales! Below is a lineup of Saturday's events. The Toy Room, 180 Greenwood Ave - ribbon cutting will be at 11am with store specials like LUKE'S TOY FACTORY will be here from 11am - 2pm, MAGNETS, The Game will be here from 12-2. We'll also have crafts to do, refreshments to enjoy, give-a-ways and raffles. Byrd's Books, 178 Greenwood Ave - will have their ribbon cutting at 11:30 with giveaways and sales specials all day, with an author talk and baking event at 2:00pm with the Vintage Baker. Coffee and refreshments will be served. Come and see their beautiful new studio! There will be dancers at the studio giving demonstrations and they will be offering coupons for discounts. Patricia's Presents - 164 Greenwood Ave - will have their ribbon cutting around 12pm. Come and see this exciting new business. Patti will have a craft person who makes dog, cat and horse silhouettes and stationary. There will also be refreshments. DiLillo Real Estate - 162 Greenwood Ave - will have their ribbon cutting around 12:30.